Nathan Hale’s brief tenure as an East Haddam schoolmaster is honored with a local monument as well as the schoolhouse in which he taught. 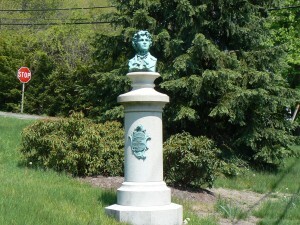 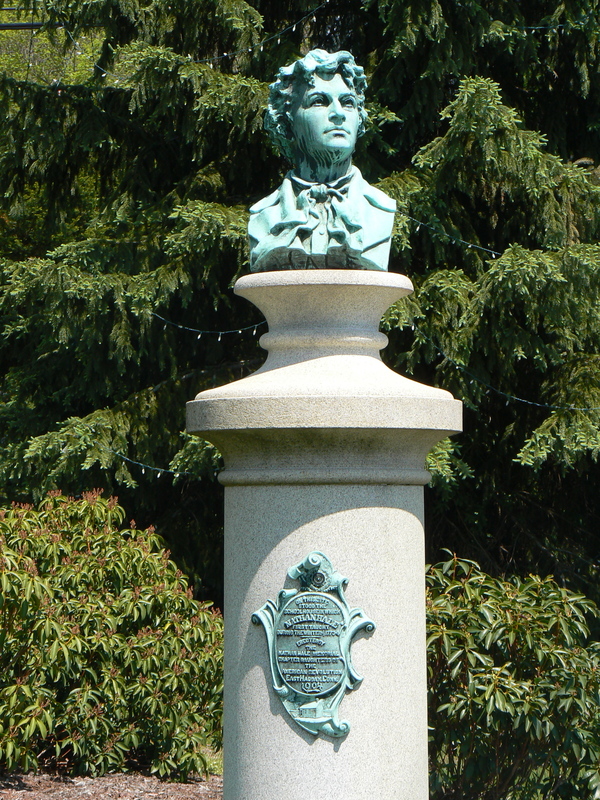 The Nathan Hale bust, dedicated in 1905, stands in the original location of the schoolhouse in what is now a small triangular park at the intersection of Main Street (Route 149) and Norwich Road (Route 82) in East Haddam. The bust stands atop a granite column that bears a plaque reading, “On this site stood the schoolhouse in which Nathan Hale first taught during the winter of 1773-4. 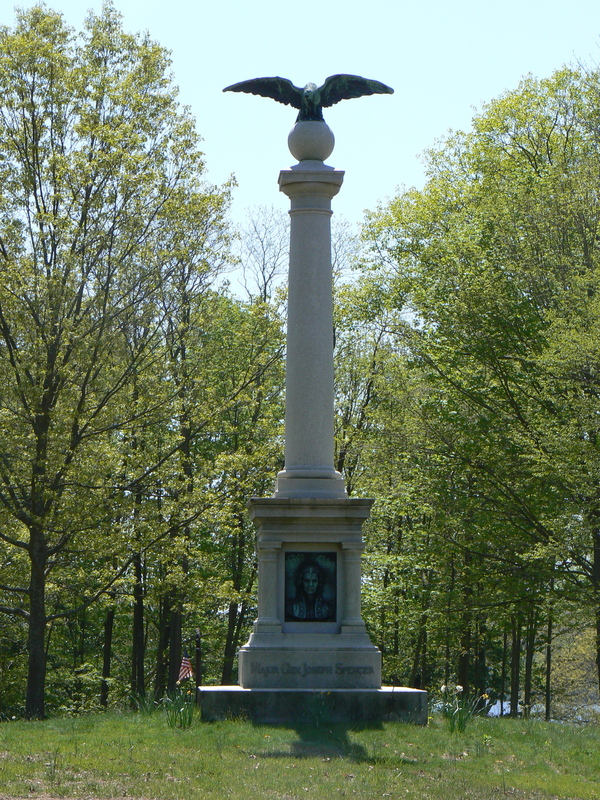 Erected by the Nathan Hale Memorial Chapter, Daughters of the American Revolution, East Haddam, Conn., 1905.” The plaque also bears an image of the schoolhouse. 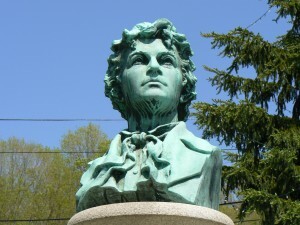 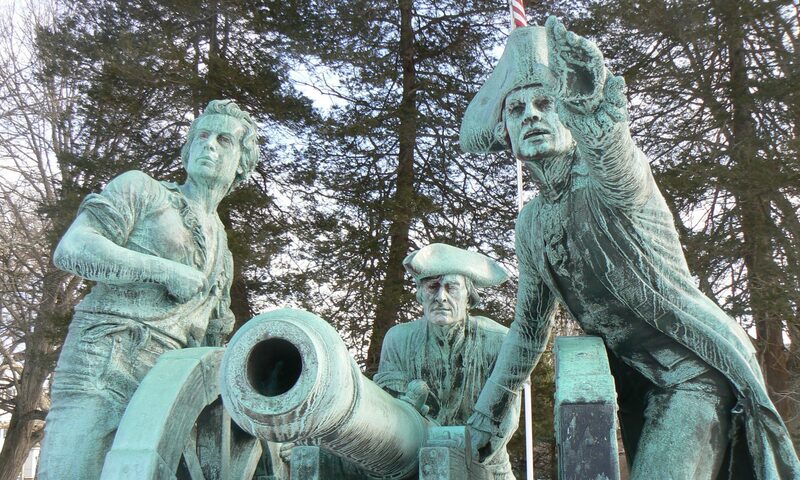 The bust was created by sculptor Enoch Smith Woods, who also produced a statue of Hale that stands outside the Wadsworth Atheneum in Hartford, as well as a statue of American Revolution hero Thomas Knowlton on the state capitol grounds. The restored schoolhouse in which Hale taught stands less than a quarter mile north of the bust, on a hilltop overlooking Main Street’s River View Cemetery. The schoolhouse was moved to its current location and rededicated in June of 1900 as part of ceremonies honoring the bicentennial of East Haddam’s separation from Haddam. 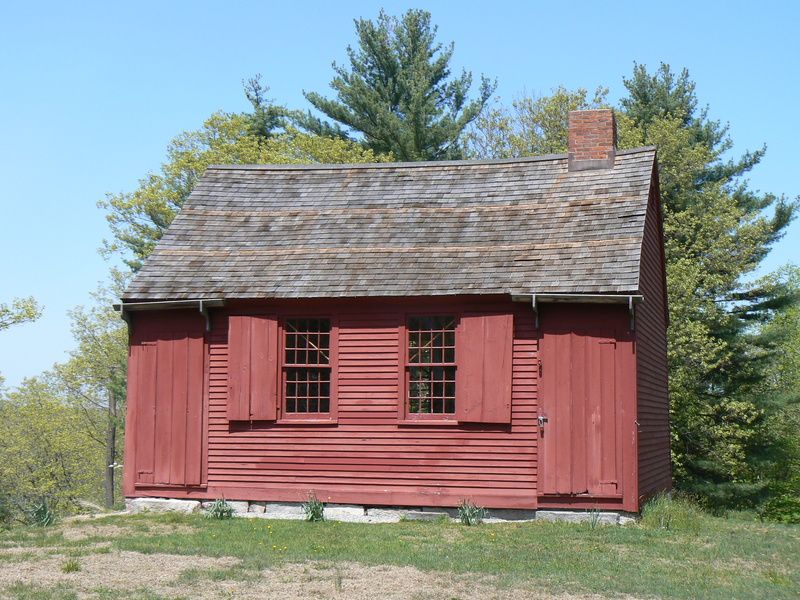 The building operated as a school from its 1750 construction until 1799, when it was moved and converted into a private residence. 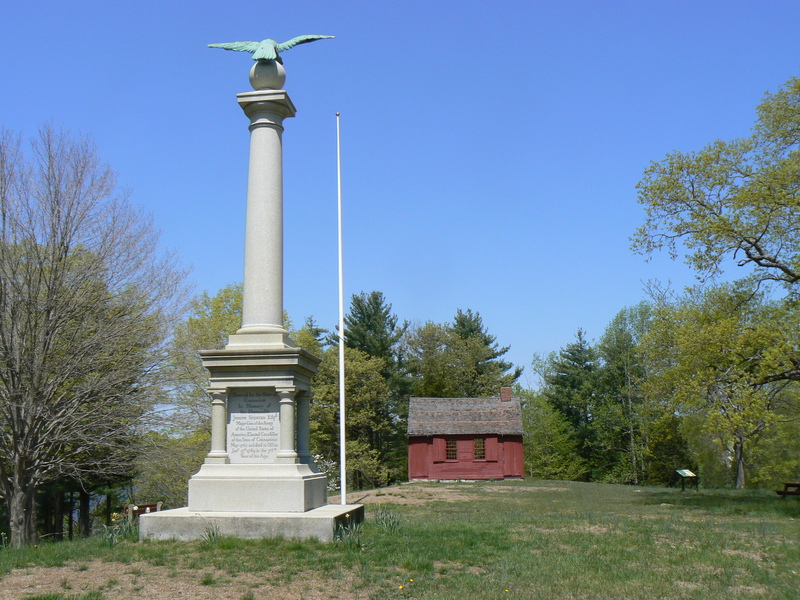 In 1899, it was moved again to its present location and rededicated as a museum. 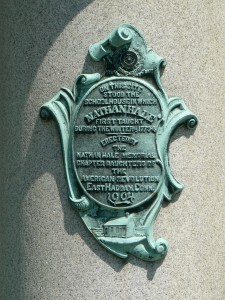 Hale’s assignment in East Haddam was his first job after graduating from Yale. 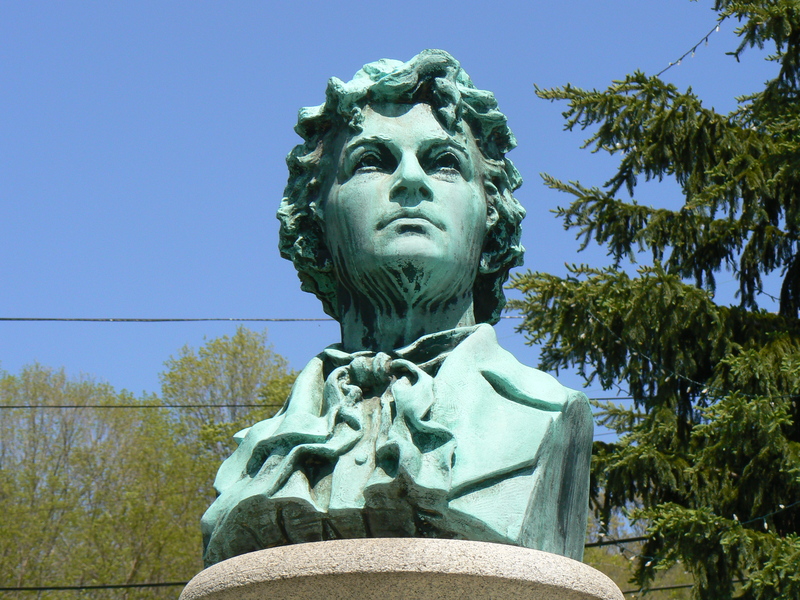 Five months after arriving in East Haddam, he left to begin teaching in New London, where he is honored with a statue and a preserved schoolhouse that also moved several times before reaching its current downtown location. The schoolhouse site, maintained by the Connecticut Society of the Sons of the American Revolution, also features a monument to Maj. Gen. Joseph Spencer, who commanded Continental troops fighting in Rhode Island during the early stages of the revolution. 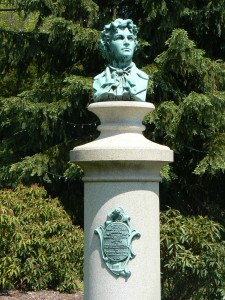 The monument was dedicated in 1904. 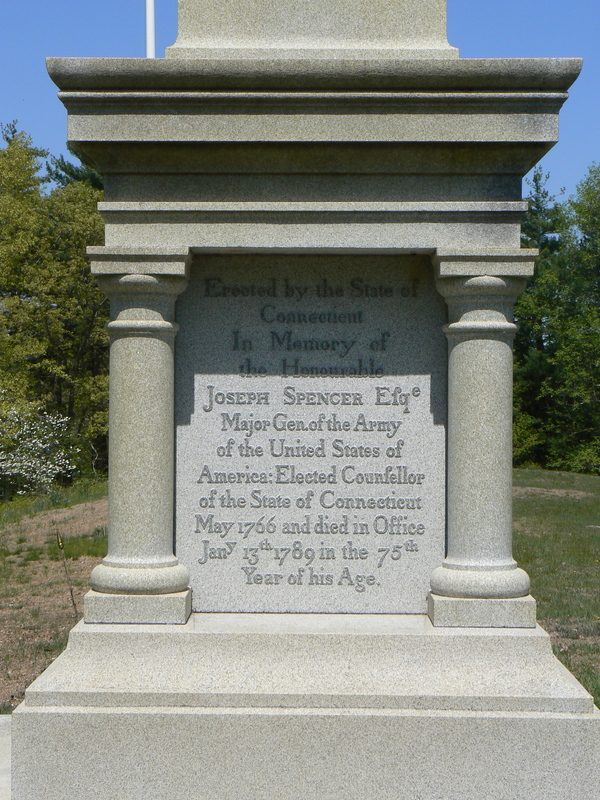 After the dedication, the bodies (and headstones) of Spencer and his wife were removed from their original location and reinterred near the monument.